Pod machines – these machines are responsible for adding additional burden to our environment with over 10 billion pods added to landfill per year. Additionally, endocrine-disrupting plastic chemicals from the pods can end up tainting your coffee. Mold – mold, mildrew and biofilms thrives in dark, wet, and warm environments and this is exactly what many coffee machines provide. Unfortunately the hot water and acidity of coffee is not enough to kill the mold and many machines are too difficult to clean before every use. The AeroPress Coffee Maker doesn’t produce any waste to landfill (especially when purchased in conjunction with the AeroPress Coffee Disk Filter) and is simple and quick to wash after each use. Don’t be fooled by its simplicity – this ingenious coffee maker produces a fine drop sure to delight even the most particular of coffee connoisseurs! 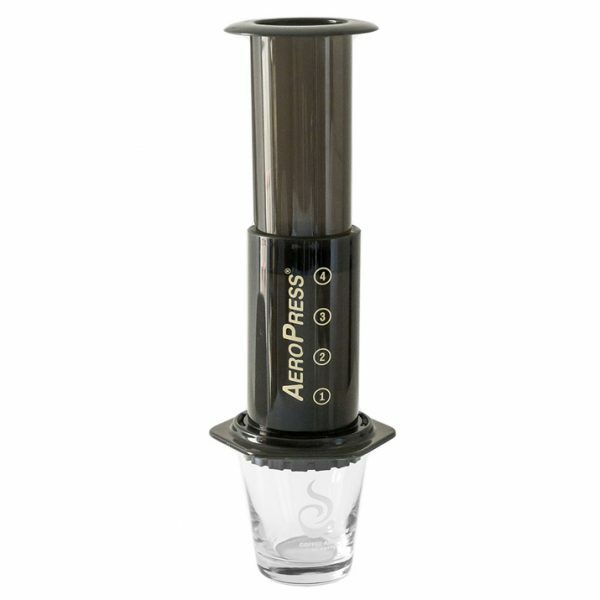 The AeroPress Coffee Maker utilises a breakthrough in the coffee brewing process to yield a smooth, rich coffee. The AeroPress Coffee Maker is a new kind of coffee press that brews coffee under ideal conditions: proper temperature, total immersion, and rapid filtering. This results in amazingly delicious coffee with a wide range of beautiful flavours but without bitterness and with very low acidity. The AeroPress coffee maker is most commonly used in the home kitchen or office but it is lightweight, compact, and durable, making it ideal for use when camping, backpacking, boating, or just traveling.